Do you know what “smartphone rings” are? This is a ring that you attach to your smartphones or phone cases, where you can insert your fingers to prevent your phone from falling. It will help you grip your phone tighter, lowering the possibility of dropping your phone and is definitely becoming a trend. This can also serve as a phone stand while making your phone look more stylish! 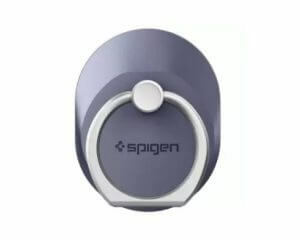 A lot of brands like Spigen, i&PLUS, and iRing have their own products with different features like those that can be removed easily or can be rotated. What kinds of products are there and how should you choose the right product for you? We will explain here the pointers in choosing smartphone rings and the top items available online. A lot of smartphone rings look similar, and that can be confusing to choose one. This smartphone rings can also be used on tablets, but how should you choose? We summarized it as below, hope this can help you out. 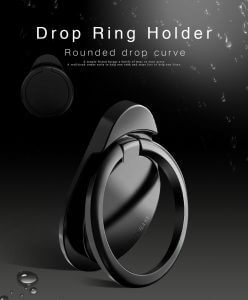 Smartphone ring’s purpose is to prevent your phone from falling, so their weight capacity is usually set heavier. 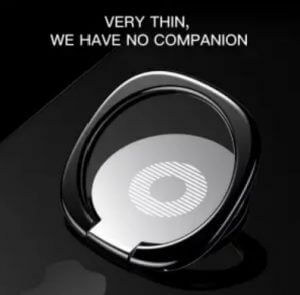 Smartphones weigh a few hundred grams, while most smartphone rings have few kilograms capacity. 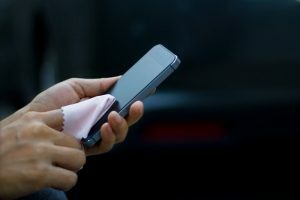 If you plan to use it on your phone, then any product will work, but if you plan to use it on your tablet, you need to check the capacity before purchasing. There are a lot of tablets nowadays that are lightweight, but it is better to be safe and aware to protect your tablet from falling, right? There are brands that don’t indicate the net capacity. For those who are worried, make sure to do some research and choose from those that only indicate their weight capacity. Smartphone rings use a special gel pad, making it possible for you to remove it and reuse it again several times. You can attach it to your new phone or new case, and use them repeatedly. Of course, you can also redo when you stick it on a wrong position by mistake. The adhesion can weaken when reused repeatedly, but in most cases, the adhesion will come back after washing with water. Although there are some products that you can only use once. We will only introduce reusable smartphone rings in our ranking, but if you are going to buy a different product, please do check if they are reusable or not. Smartphone rings are originally invented for sticking on your phone. Though there are a lot of people who don’t want to stick it directly on their phone. If you are one of them, you can stick it on top of your smartphone case. 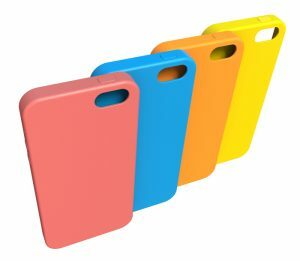 There are so many types of smartphone cases, with different materials such as plastic, leather, silicone, and cloth, but cases with “flat and shiny surface” are the only ones that you can stick smartphone rings on. One of the popular soft silicone cases have a flat and shiny surface, but it can be difficult to tell if a smartphone ring can stick to it. Make sure to check your phone case beforehand to prevent disappointment after purchasing smartphone rings. Transparent plastic cases are good to go, but most silicone cases are usually not compatible. We will now show you the top 10 recommended smartphone rings in rank order. We selected a wide variety of products from affordable products to expensive ones, cute ones to stylish ones, hope you could use this as your reference! 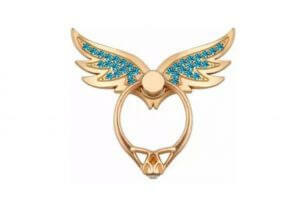 Its cute bat shaped design is one of the reasons for its popularity from both males and females. It can also be rotated 360 degrees for easier adjustment when you need to use it as a stand, or when you want to adjust your grip while keeping its cute appearance. The weight capacity is 5 kg, but some users mentioned that the adhesive is not that strong, unfortunately. Add Style to Your Phone in an Instant! This product is perfect for those who want to add style to their too simple phone. This will not only work as a smartphone ring, or stand, it will also act as a fashion accessory. It will look like you are wearing jewelry while you’re using it because the ring has a rhinestone on top. It can be a perfect gift for your loved ones too with its pretty design. This product might have a simple design but it has very convenient added features. It has a hook mount that you can attach to your car’s dashboard, perfect for when you want to listen to your favorite music, or when you want to use a map app while on the road. It is a bit expensive because of its durability and stability, but there were reviews that mentioned it broke during a sharp curve, so please be careful and keep that in mind. This product is as thin as 3 mm and won’t bulge out, making it easier to put your phone in your pocket or small pouches. A lot of reviews commended the strong adhesion too, and it can be attached to a magnetic phone holder too if you have one. Although there were reviews that mentioned that the ring broke, or won’t stand up, so its durability is a bit questionable. 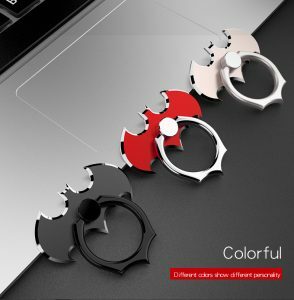 This product is perfect for those who are looking for a simple, yet stylish design and it comes in 4 different colors to match your everyday style. It has a matte surface to protect it from scratches. 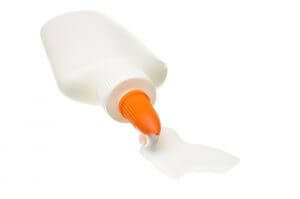 This product uses a reusable and washable 3M adhesive for superior adhesion, that can support bigger gadgets. Perfect for those who are planning to buy for their tablets. 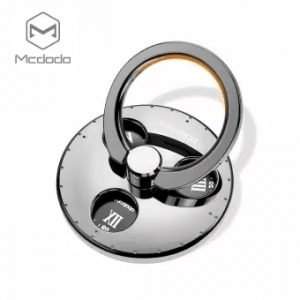 This product has a clock design under the spinner, that can come in handy if you need to take note of the time, like the last time you took the medicine or the meeting time, etc. It also works as a fidget spinner that is becoming popular nowadays that can be used as a stress reliever. It can be perfect for anyone with its simple and unisex design. Lastly, we would like to explain the tips in placing smartphone rings. Smartphone ring’s adhesion will deteriorate if the surface has dust, oil, or dirt on it. Make sure to clean first the surface before sticking your smartphone ring. The placement will also become very important, as it can affect the way you access your phone while using the ring. Try to check first your finger placement, and make sure to stick your smartphone ring in the best position. If you need to remove the ring, do not force it. Try to twist it or tilt it and remove it little by little. You can also use cards to effectively remove them. Smartphone rings are usually something that “you won’t be able to live without” once you tried it out. You won’t need to worry about your phone hitting your face when using your phone while lying down. All products may look the same, but each product has its special characteristics, make sure to check them out. Smartphone rings that will protect your smartphone. Hope you can make your smartphone life a more enjoyable one! A “passport case” is a necessary item that protects your passport. Products with anti-skimming features are now increasing, making it an item that is indispensable during trips. There are products from famous fashionable products made from leather, or those you can hang on your neck, and many other variations of passport cases. It can be a little confusing to choose once you have decided your purchase. So we will introduce passport cases available online, and show you the top items in rank order. Hope you can find the item that is perfect for your travel style. Are Passport Cases Necessary? Passport cases are as the name says it, a case for your passport. There may be some of you who are thinking “is it really necessary?”. You should always be alert and aware of pickpockets and snatchers, especially in a foreign land where you might be too busy looking around. It doesn’t really matter which country you choose as your destination, as long as you are a “tourist” you may become a target.